Yesterday, I mentioned that I would not be using geomorphs for creating my version of the Chateau des Faussesflammes. This is a decision I am not at all fond of, not only because of the ease with which one can make dungeons with geomorphs, but also because of the nature of The Dungeon as suggested in Holmes. If The Dungeon is a constantly shifting semi-intelligent NPC in the campaign, geomorphs are the easiest way I know of to represent it. If I proceeded with normal dungeon maps, shifting and changing bits and pieces would mean having to re-do these maps every time I want to make a change. Ultimately, this choice would discourage making changes and The Dungeon would have less impact on the game. Geomorphs, on the other hand, would allow 100 x 100 sections to be easily removed, added or changed. It would even be easy to randomize the changes. For example, there could be a standard 1 in 6 chance for every geomorph explored by the characters to change in-between dungeon-delves. I have been busying myself with the prospect of creating a dungeon in homage to the Chateau des Faussesflammes, one of the ruined castles mentioned by CAS in his stories of Averoigne. Being in a Holmesian kind of mood, I have been trying to tackle this particular project by reverse engineering the Sample Dungeon in the Holmes Edition. In some of my initial forays into the project, I have found an interesting curiosity. The average room size in the Sample Dungeon is 60 x 60, which easily takes up more than half the space on the popular 100 x 100 geomorph used by the good folks who draw them for Dave's Mapper. The largest rooms in the Sample Dungeon wouldn't even fit on a single geomorph. Even more interesting is that the Keyed rooms are on average almost twice as big as the Empty (E) rooms (75 x 65 compared to 35 x 35). 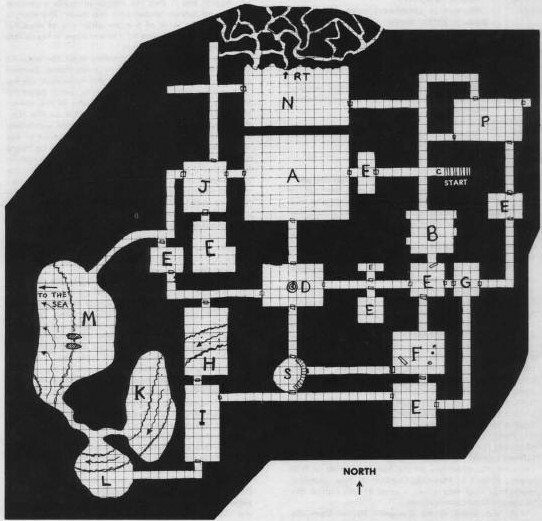 This got me thinking about the necessity of designing a dungeon with such large rooms and, in particular, encounter areas. I think this largely has to do with the way combat works in Holmes. Missile (and Magic) combat is largely distinct from Melee combat. Once Melee combat is engaged, Missile (and Magic) combat effectively ends, due to the fact that missile fire and spells have a chance of hitting the wrong target. Given this style of combat, movement and closing into melee and/or maneuvering to avoid melee becomes a vital element of the game. If combat were confined to small spaces (such as the majority of the rooms found in 100 x 100 geomorphs) this ability to move would be severely limited. Most combats would engage in melee almost immediately, reducing the usefulness and effectiveness of characters interested in using bows and spells. Therefore, Holmes provides encounter areas with plenty of room to maneuver. Besides offering more evidence that the Dungeon is an ever-changing underground spawning new rooms, passageways and even monsters, the size of Empty rooms also implies an attempt by Holmes to make them dangerous. The only monsters a party of adventurers would encounter in an Empty room are Wondering Monsters, which are meant to be a major part of the Holmesian dungeon-delving experience. Outside of evidence of an ever-changing semi-intelligent dungeon, they seem rather innocuous. Their significantly smaller size, however, limits any combat that does happen within them. 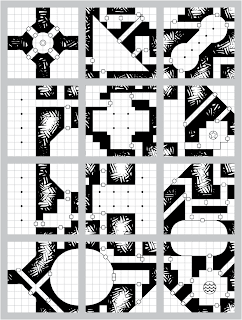 Like the rooms on a typical 100 x 100 geomorph, the smaller Empty rooms limit tactical choice in combat. They are therefore a more dangerous place to encounter wandering monsters than a normal encounter area. The long and the short — I (unfortunately) won't be using geomorphs to do my version of the Chateau des Fammesflammes because Holmesian dungeons need significantly larger rooms than we modern gamers are used to. I shall also be endeavoring to have my dungeon create a sense of claustrophobia with players despite these larger room sizes. Hopefully, they will come to fear the smaller Empty rooms, where wandering monster encounters are truly dangerous. Given my recent interest in an Averoigne-like campaign setting, this poem just feels right — like it somehow should be a part of the fabric of the campaign. There has to be an adventure in here somewhere — what dangerous direction could the visage of a burning babe lead a band of adventurers? Today is the Aπόδοσις (Apodosis), or Leave-taking of the Nativity of St. John the Baptist. The actual feast occurred yesterday, but when it comes to a lot of the bigger feasts in the Christian calendar, Orthodox Christians don't celebrate for just one day. Depending upon the feast, these celebrations can last anywhere from 2 to 40 days. The last of these days is the leave-taking of a feast, where much of the original service of the feast is repeated. Most of the feats that have an apodosis are either major feasts of the Lord, like Christmas and Pascha (Easter), or of the Virgin Mary, like the Annunciation or the Nativity of the Theotokos. There are, however, a few feasts that fall outside of these that do have an apodosis. Besides of the Nativity of St. John the Baptist, they include the feasts of St. Demetrius, Sts. Peter and Paul and the Beheading of St. John the Baptist. In a fantasy setting, especially one that is analogous to the medieval world, a festival is going to go on for several days and the last day of the feast is going to be as big as the first. Though he is a hugely popular saint today, St. Demetrius was at one time only known around the environs of Thessaloniki. Therefore, feasts need not necessarily be about huge, over-arching theologies or events (though they may be implied). For example, a roll of 7 on the Event Commemorated table results in "Discovery/Recovery." This is followed by rolling a d6 to find out what is discovered or recovered. A roll of 2 indicates the "Skull of..." To find out whose skull, roll on the Person Commemorated table. A roll of 8 indicates the "Mother of..." In order to find out whose mother, another roll is made, ignoring any result of 8. A roll of 3 indicates a "Regional Saint/Hero." To find out how long the feast is, a roll of 5 on the Length of the Feast table indicates 2d10 days, which results in one week of celebrations. Thus, the feast generated would be The Discovery of the Skull of the Mother of a Regional Saint which lasts a full seven days. That sounds a lot more interesting than "harvest festival," doesn't it? The flowery Green Cross in comparison to the simple and austere White Cross implies a counter-intuitive logic of prayer vs. work. One might think that Green Monks would prefer something like the White Cross, being that they are such an austere order; however, prayer is an elaborate and beautiful endeavor. Thus, they wear an elaborate and beautiful cross. The Black Cross, with the four squares surrounding it visually suggest their quest for balance between prayer and work. 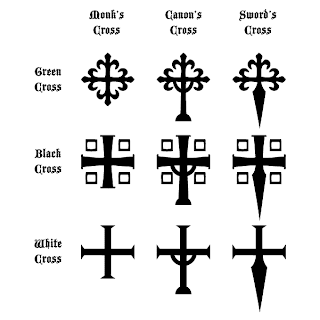 The Canon's Crosses add a visual variation suggestive of a chalice — a symbol of the priestly function of preparing and distributing communion. Likewise, the Sword's Crosses have a variation suggestive of a blade — both in concert with their name and their occupation as soldiers. In the wake of the creative onslaught that assaulted my brain after reading The Beast of Averoigne by CAS, I have been brushing up on Western monasticism in order to be able to piece together an appropriate ecclesial structure for a campaign set in a fantasy version of southern France. In order to do this, one actually has to start in the east. Christianity has from the very beginning had a monastic character. Though he was certainly not the first monk, St. Anthony is considered the grandfather of Christian monasticism. He was a hermit of the Egyptian desert in the late 3rd century and early 4th. His life was record by St. Athansius the Great. This was translated into several languages and became an extremely popular book. It inspired an entire generation (and continues to inspire, I might add). With the advent of Christianity not only being tolerated by the Roman Empire, but being the preferred religion of emperors, the first great era of martyrdom came to a close. Facing a world where there was no possibility of following in the footsteps of the great Christian heroes into martyrdom and inspired by the Life of St. Anthony, an entire generation went into the desert. There, two basic styles of monasticism developed: cenobitic (communal) and eremitic (hermit-like). St. Basil the Great is seen in Orthodoxy as a founding monastic legislator, whose rules are still used by Orthodox monks today. St. Benedict, using St. Basil's rules as a model, wrote his own Rule which became the model for Western monasticism. Benedictines: (mentioned in The Beast of Averoigne), also known as black monks (because of their black/dark robes) who are followers of the Rule of St. Benedict. It is a cenobitic order. Cistercians: also known as white monks (because of their undyed robes). They also follow the Rule of St. Benedict, which they attempt to follow in exactness. They emphasize field-work and are famous for their agriculture (they introduced a lot of agricultural technology to Europe) and as horse breeders. The only income they accepted was from this field-work (no gifts, no tithes, etc.). It is a cenobitic order. The Knights Templar were Cistercians. Carthusians: also known as charterhouse monks. This is the most austere of the orders. They shaved their heads, wore horse hair shirts and took a vow of silence. They lived as hermits, gathered together only for services and ate together only on Sundays. It is an eremitic order. In more modern times, they made famous a green liquor known as chartreuse, from which the pale green color gets its name. 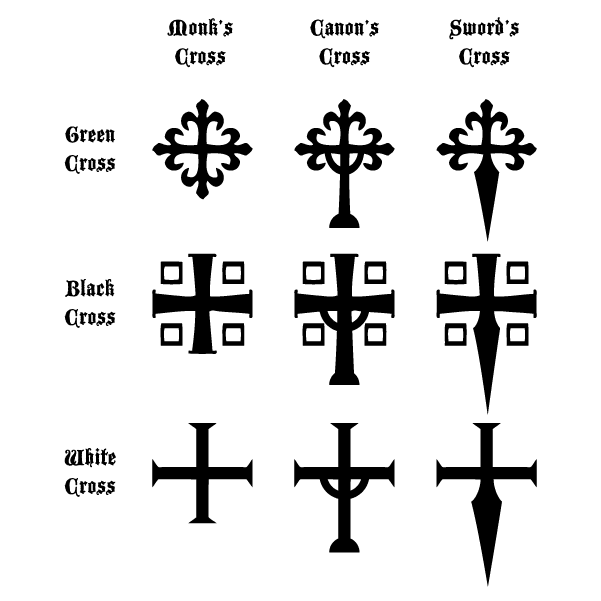 For the purposes of using these three orders to inspire monastic orders for a fantasy world, I am going to adopt the names black monks, white monks and green monks. These primarily refer to the color of the robes that they wear. One of the basic credos of the Rule of Benedict is the simple phrase Pray and Work. White monks emphasize work, being excellent farmers and horse breeders. They live in communities in rural and wilderness environments. Green monks emphasize prayer. They are famous for their elixirs (derived from the same plants that they use to dye their robes) and live primarily as hermits in the wilderness. Black monks seek to find a balance between work and prayer. They tend to live in communities in or near urban centers. In addition to monks, each order would have two sub-orders: Canons and Swords. Canons are those ordained priests who have taken monastic vows. Interestingly, the Eastern Orthodox practice of allowing marriage prior to ordination was still in use in Western Christendom at this time, though frowned upon. I like the idea that cleric characters don't necessarily have to start out as ordained clergy, but would have to be ordained in order to receive 3rd level spells or higher — thus marriage is a possibility for those inclined. Swords are the military arm of the order. These would be the Knights Templar or the Hospitallers of this fantasy world. Cenobitic order whose abbeys are primarily in or near urban centers. They seek to find a balance between prayer and work. Known for their black/dark robes and their uncut hair and beards. Also known as Nazirites. Ordained priests who have taken a monastic vow with the Black Monks. The military arm of the order. They have served extensively in the East, explaining the heavy eastern influence on the order. Cenobitic order who emphasize field-work. They are especially gifted farmers and horse breeders. Known for their undyed robes and their "bald spot" tonsures. Their abbeys are primarily in rural or wilderness areas. Ordained priests who have taken a monastic vow with the White Monks. The military arm of the order. While they also have served in the east, they have had more influence in the West. There are rumors of corruption, hidden treasures and even sorcery among its members. Eremitic order who primarily live in the wilderness. Emphasizing prayer, they are known for their green robes, which are dyed with the same plants that they use to make their green elixirs. They shave their heads and take various vows of silence. Ordained priests who have taken a monastic vow with the Green Monks. The military arm of the order. The smallest of the three military orders, these soldiers are famous for their unarmed fighting techniques. I have been running some hypothetical combats using the Holmes rules as I have come to understand them in order to see how it feels. One of the things that had become immanently clear is that a central factor in combat is closing into melee. Those that do not have missile capability will want to close as soon as possible. Those that have good missile capability will want to prolong missile combat for as long as possible. The reason: missile combat is deadly — as it should be — and missile combat effectively ends once melee begins. This reality, however, brings up a bit of a surprise. The most vulnerable characters to missile combat are the ones who normally can only really function effectively during missile combat — magic-users. When understanding normal missile fire as volleys, targets are determined randomly. This means that magic-users have an equal chance of being targeted as anyone else. They can't hide behind the fighting-men. If they are targeted, chances are they are not only going to be hit, but killed. Ironically, in order to use their spells (especially combat spells) they need to be in missile combat. Once melee begins, they cannot throw around spells without risking the chance of affecting the wrong target. By means of this spell the user imposes a self moving magical barrier between himself and his enemies. It provides the equivalent of plate armor and shield (armor class 2) against missiles, chain mail and shield (armor class 4) against other attacks. Players will get frustrated at the casualty rate of magic-users. Combat encourages them to engage opponents when they are most vulnerable. That is not a good combination. Most, if not all, magic-users in the game will be elves, because of their ability to wear armor and thus actually have a chance to shine as a spell caster. If a character is armed with a shield, they can voluntarily become the target of a volley shot against an adjacent character. Over the weekend, I have been very much distracted by Mr. Clark Ashton Smith. I am not unfamiliar with his writings, even though I only discovered him as an adult; however, to date, I have mainly read his Zothique Cycle of stories. While I certainly enjoy his prose and would gladly read them again and again rather than what has passed for science fiction/fantasy over the last couple of decades, his stories have never really fired up my imagination. Until now. This weekend was the first time I ever ventured into Averoigne. Smith's The Beast of Averoigne caught me by complete surprise. There are stories that really excite and entertain. There are those that inspire. This one sent explosions of creativity bursting through my brain. First of all, I love the groundedness of the story. I felt comfortable in the world — as if I were somehow familiar with it despite the fact I had never before read anything about it. Secondly, I love the implication that the Beast itself is extraterrestrial. This leaves all kinds of room for whatever monstrosities one wants to inflict upon a campaign world (gonzo or no). Finally, as someone who has not only spent quite a bit of time with Holmes, but extrapolating an assumed world from those rules, I have to ask: Is there a better example of a literary world for playing Holmes in than Smith's Averoigne? Personally, I can't think of any. It implies a Christian civilization at the edge of the wilderness. Although tolerated, arcane magic is frowned upon as being pagan and corrupting. There are Inquisitors that monitor and arrest wizards who do not use their magic to benefit the citizens of Averoigne. The corruption of arcane magic dates to before the advent of Christianity, and runs deep. There are powerful magic items which date from these ancient times. There are plenty of ruins and abandoned chateaus (and therefore, potential dungeons) available for exploring. From a purely (and geeky) historical point of view, the southern part of France (which is approximately where Averoigne would be) is a fascinating model for any campaign — especially if one chooses A.D. 1100-1350 or so. Pope Clement V refused to move to Rome. As a result, the papal court moved to France. A total of seven popes reigned from the Papal palace in Avignon. In addition, two antipopes used Avignon as their headquarters. This juicy history is chuck full of possibilities for all kinds of campaigns. I also have in my possession an hagiography written by St. Gregory of Tours. In it he details the lives of several Gaulic saints from the 5th-6th centuries. Though this is well outside the time frame of an Averoigne-based campaign, it does lay the foundation for the beginnings of Christianity in the campaign world. These saints can be the background noise that defines the Christian civilization. Finally, with the campaign world being so firmly grounded in a real-world location and time-frame, the clothes, armor, weapons, names, etc of characters can be clearly delineated. There are plenty of books available that can help define what it is a character can expect to be able to own and what they might look like. I love it when a story starts me down a path like this…I just hope these seeds can someday come to fruition. St. Leontios was the military-chief of the imperial army in the Phoenician city of Tripoli during the reign of Vespasian (A.D. 70-79). He was held in high regard by the people of Tripoli because of the virtue he displayed in living out his Christian life. When the Roman senator Adrian became governor of the Phoenician district, he was given full power to hunt down Christians in order to force them to worship the Roman gods or face torture and death. When he found out about St. Leontios convincing folks to stop sacrificing to idols, he sent the tribune Hypatios to Tripoli to arrest him. On the way, he fell seriously ill. In a dream, he saw the vision of an angel who told him that if he wished to get well, he should cry out three times: "God of Leontius, help me!" When he woke, he told his friends among the soldiers in his command what had happened and they prayed to the God of Leontius. Hypatios was immediately healed. Among these friends was Theodulus who was filled with the need to take Hypatios with him as they raced ahead of the other soldiers in order to find St. Leontius. Arriving in the city, they were welcomed by a kind stranger who invited them to his house. When this stranger turned out to be St. Leontius, they begged him to teach them about the his God. Having been baptized by the time the other soldiers arrived in the city, now led by Adrian, all three were arrested. Refusing to sacrifice to the idols, they were tortured and then martyred. Given the centrality of the angelic vision granted to Hypatios in the story of these three martyrs, I thought I'd write about visions as I use them in my campaign worlds — and I tend to use them quite a bit. When used well, they can add a lot of gravitas and mystery to the game world. There are several keys to an entertaining vision. First and foremost, it must allow for player choice. This is most easily accomplished by giving the player enough information to peak their interest without giving too much information. It also helps to have something to reveal. Personally, when I create a world I always try to have a skeleton of a backstory that can be revealed over time as the players interact with the world. This backstory need not be The Silmarillion nor even the appendices to The Return of the King. In my own Lost Colonies campaign, the back story can be explained in no more than a few sentences, but it is enough to drop tantalizing hints all over the place. It is then up to the player to interpret what they have seen. In my own personal experience, they sometimes come up with a much cooler explanation than what I had in mind. When this happens, I usually run with it, because the vision then becomes personal. In turn, so does the campaign world. In Holmes, Dexterity = initiative. Therefore, it is not a huge leap to say that Dexterity also = AC, where AC is the target number for the attacker. If Dex = AC, this doesn't leave much for armor to do. I very much like E&P's handling of this, where characters can choose to use either Dex or their armor's AC (which ever is better); however, Dex also equalling initiative inspires me to take armor off in a different direction. Thus, if you wear plate and carry a large shield, you are going to be slow and be hit a lot, but won't necessarily take a lot of damage. If you have an 18 Dex, you are going to go first in most combats and aren't going to be hit that often, but when you are, you will take full damage. [Those things necessary to produce magical items] should be difficult to obtain, and the spell caster will often have to adventure to acquire the items, for there are no magic stores. This begs the question, especially since there are rules in both Holmes and Cook for creating various magic items, what are the economics of magic? There are four different systems given in the pages of Holmes and Cook. Holmes indicates that any magic-user (but makes no mention of clerics) of any level can create scrolls for 100 gp and 1 week for every spell level to be inscribed upon the scroll. Cook notes that Alchemists, if given a formula or sample, can produce potions at half the normal cost and time. They can also do magical research on potions at twice the time and cost of magic-users. All of this incurs the extra cost in the alchemist's monthly stipend of 1000 gp. In his section on Magic Research and Production, Cook specifies that only magic-users and clerics of name level (9th level or higher) are able to create magic items. The cost for duplicating normal spell effects requires 500 gp and 1 week per spell level duplicated. Given that he fixes the price of a Wand of Fire Balls at 30,000 gp and a time frame of 4 months, this means that this price is for every single charge placed in the wand. These endeavors always have (at least) a 15% chance of failure (and thus creating a cursed item). Cook continues to give the DM much more leeway in determining the price tag on items that do not duplicate spell effects. For example, he suggests plate mail +1 should cost 10,000 gp and take 6 months. Given that a suit of plate mail only costs 50 gp (Holmes) to 60 gp (Cook) and that something as exclusive as a warhorse in barding costs 400 gp, this places even something as relatively inexpensive as a Scroll of Light well out of the price range of what any but the most wealthy could afford. Remember that at least 3 in 20 of these items are going to fail, which makes the endeavor to pay for magic item creation even more expensive. All of this indicates that Cook is right in his assessment that there are no such things as magic shops — these items are just too expensive to expect there to be any kind of market; however, by including the alchemist in his list of Specialists and Mercenaries he indicates that there is a demand. The only social stratus that can afford to demand magic item creation is the very rich. Given the inherent danger of this kind of endeavor (at least 15% of items will be cursed), implies either some kind of social pressure that holds enough sway so as to outweigh the possibility of a curse and/or a disquieting level of comfort with all things decadent and corrupt. Given that the majority of magic items duplicate magic-user spells rather than cleric spells seems to indicate that magic item creation and its inherent risks are primarily an arcane magic-kind-of-thing, possibly even a pagan-kind-of-thing. Since it is the rich and powerful who are the ones who would demand magic item creation, it would seem that there is an inherent conflict between church and state, where the state is more inclined towards paganism and the arcane power that comes with it and the church is more inclined to frown upon magic item creation of all kinds (possibly even including divine magic items). The implied Guild structure of magic-user training and the reduced price of scroll creation, however, leave room for a middle way. The church could oversee and sanction certain magic item creation. There might be a mechanism where cooperation between magic-users and clerics reduces the potential harm of a cursed item. Indeed, I might wave the 15% chance in the case of scrolls if the magic-user inscribing them either pays a registration fee or otherwise works in concert with the church directly or through the Guild. Magic research and production is both dangerous and expensive. Such research can only be accomplished through a patronage system, where there exists a demand among rich and the powerful. The church sees both the benefits and the corrupting nature of magical research. While overall discouraging such research, it does work in concert with the Guild in order to make sanctioned research as safe as possible. The Guild willingly works in concert with the church because, while greater magic might be possible outside the confines of sanctioned research, it is certainly safer. Any overly-regulated economy is going to have a black market. In this case, given the corrupting nature of arcane magic, the word black is more than appropriate. Given a black market, there is more than likely some kind of Inquisition-type of institution within the church (whether overt or covert) that tries to keep such activities to a minimum. His intelligence is only 10 (equal to maybe an IQ of 100!) and he can not have studied and copied into his books all the spells listed under Book of First Level Spells (this list is given later). Besides the cool factor of such a mediocre prime requisite in an example character (are the other stats just that bad, or does the player really want to play a magic-user? ), there is this curious title given the first level spell list — Book of First Level Spells — a curiosity that extends to both second and third level spell lists, which are also labelled as Books. The example seems to allow Malchor to go through all fourteen spells in this list in order to see if he understands them. According to his Intelligence, he will have a minimum of 4 of these in his spell books and a maximum of 6. Theoretically, therefore, if a magic-user had a 17 or 18 Intelligence, he could have every single first-level spell in his spell book. In calling his spell lists Books, and by allowing first level magic-users the potential of having any spell from the Book of First Level Spells, there is an implication that there is some kind of standardization in magic-user training. Regardless of who you are, what alignment you have or where you are from, as a magic-user, you studied the Book of First Level Spells. Depending upon your natural aptitude (Intelligence) you learned some, if not all, of those fourteen standard spells. In a society that has moved away from the arcane magics of the past towards divine magic because of the potential corrupting nature of the arcane, it may very well be illegal to know or cast spells outside the Books. There is a highly organized Guild that tightly monitors its members and is the primary source for all higher-level spells. They could also be active in commissioning adventurers in order to find (and therefore control) classical and ancient magic. The Books represents the sum total of everything that arcane spell casters know. All the other knowledge is lost (or kept secret by those individuals who possess them). Given that there is only a flat 20% chance for success when creating new spells and a price tag of 2000 gp per spell level regardless of success, this actually seems rather plausible. What joe-normal magic-user has an average of 10,000 gp/spell level of disposable income to create new spells? It is probably far more economical to hire adventurers to go find stuff than to do the research. The long and short of Holmes using the phrase Book of First Level Spells is that magic-users are all going to have some kind of shared experience — whether that experience is a Guild, a legal reality, a dearth of knowledge or all of the above. Update: Another thought just came to mind. Given that Holmes has an entire section of his edition dedicated to explaining the various (and potentially confusing) ways that the word level is used, it would seem to me that the title of the Book of First Level Spells could be tweaked in order to eliminate "level" from spell lists. and beyond compare more glorious than the seraphim. Today the Orthodox Church celebrates the revelation of the hymn Axion Estin (It is truly right) by the Archangel Gabriel to a monk on Mt. Athos. This particular monk was a disciple of an elder who instructed him to read the prayers of the services one Saturday night while the elder went off to the cathedral of the Karyes monastery on Mt. Athos. His prayers were interrupted by a knock on his door, where he found another monk calling himself Gabriel who wished to pray with him. This they did. During the Matins service, there is a poetic style of hymns called the Canon, which has nine odes. Each of these odes is based upon a hymn found in scripture. The ninth ode is based upon the Magnificat (Luke 1:46-55). This hymn is often sung with the refrain More honorable than the cherubim (the last four lines above). Deeply moved by the beauty of the hymn, the monk asked Gabriel to write it down. When the monk could not produce any paper or any device to write with, Gabriel took up a roof tile and etched the hymn into the rock with his figure as if the tile were made of soft wax. After giving the monk the instruction to have the whole Orthodox world sing this hymn, the angel disappeared from sight. Orthodox Christians have been singing Axion Estin ever since. Even in the brilliantly wonderful corner of the blogosphere that is the OSR, I am acutely aware that the cleric is not exactly a popular class. I think only the lowly thief has earned more ire; however, next in line for an overhaul or an outright elimination is the cleric. Part of this is the mechanical rather than archetypal origin of the class. Another has to do with the very strong affiliation with Christianity in its genesis (remember, there were no "holy symbols" in the early editions, only crosses). Once TSR decided to try and be more PC in the face of being accused of promoting satanism etc., the cleric class lost its moorings and in an ironic twist, lost all connection it had with its Christian origin. Recently, though, I have been wondering if it isn't because of that sticky word that is at the root of everything the cleric is about: faith. I think this word is greatly misunderstood, in part because in English it is anemic in comparison to the Greek that it tries to translate. The Greek word is pistis (noun) or pistevo (verb). In addition to faith, these Greek words can be translated as belief, loyalty and trust. The difficulty comes in that it really means all three at once. To have faith in God means to believe in Him, to be loyal to Him and to trust in Him. Our example par excellence for faith is the Virgin Mary (known in the Orthodox world as the Theotokos or the Birth-Giver of God). It is truly right to call her blessed because she believed, she was loyal and she trusted. So, for those who are looking to tweak the class, I encourage you to consider the real definition of faith, and look to the Virgin. She'll show you the way. Currently, where I live is going through one of those fascinating life cycles found in nature. 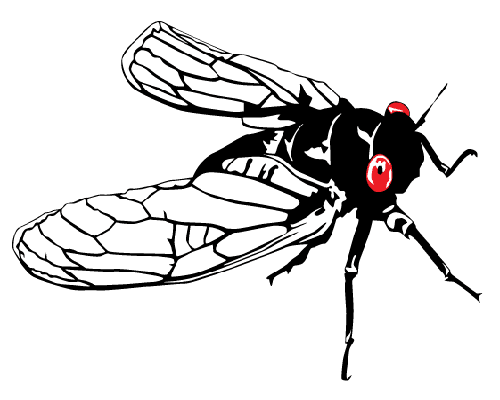 Our trees are inundated with thousands of red eyed cicadas. Despite having experienced this phenomena several times in my life in various parts of the country, I am always amazed at how loud they are. This got me thinking about what that might be like if they were bigger…much bigger. These wandering giant insects are normally only found in groups of one to four; however, if threatened they will start vibrating their abdomens, creating a noise that attracts more tettixi. Every round that a group of tettixi makes this noise 1d4-1 more will show up. In addition to attracting more tettixi, this noise effectively acts like a Silence 15'r. spell — the noise is so loud that speaking and casting spells becomes impossible. Further, if there are ten or more in the same area making noise, the sound becomes so loud as to do damage to other creatures. Each round this sound will do 1d6 damage for every 10 tettixi in the area (half if a save versus dragon breath in made). The abdomen of the tettix is highly valued because they can be used as a one-use Detect Lie device (it rattles if a lie is detected). As I mentioned yesterday, there are several dragons (blue, gold and green) that appear in Cook's wandering monster tables that are not found in either his monster section or the one in Holmes. While Cook does provide statistics for these dragons, they are missing two key elements that define what a D&D dragon is — alignment and a breath weapon. In order to determine these traits for Cook's dragons, I must look to Holmes and how he seems to see them. I am going to begin by comparing red and white dragons, because (believe it or not) they are the most similar of the four in Holmes: they both have coned breath weapons that are expressions of thermal energy. Reds have a breath weapon that violently releases thermal energy; whites have one that violently extracts thermal energy. Reds are the only type of Holmesian dragon that are not cursed with animal intelligence; whites are the most likely to be cursed. White dragons are the female of the species and reds are the male. (Holmes indicates in his description of dragons that the smallest dragons are "positively female" and the largest dragons are "positively male"). Alternately, if one interprets this Holmes description to mean that all types of dragons have both male and female, reds can only breed with whites and vice-versa. White dragons evolve into red dragons (where the intelligent whites are the only ones who know how; thus, all reds are intelligent). This last option, however, only works if both the brass and black dragons are the weaker of their dragon pairs (since both are subject to being cursed with animal intelligence). Both have 6-8 HD (higher than the white's 5-7 HD). The brass have a natural pair with Cook's gold dragon (since they are both metallic) which has 11 HD — one higher than Cook's version of the red dragon. Interestingly, Cook seems to fix the dragon HD at the middle of the Holmes HD range. Thus, a white has 6HD, red has 10HD. This is a difference of 4HD. The middle of the bronze HD range is 7; also a difference of 4HD when compared to the 11HD gold dragon. This suggests a pattern applicable to all dragon type pairs: the smaller of the two will always have 4HD less than the larger. Given this, black, blue and green dragons don't appear to be natural pairs. This suggests that there are three additional types of dragons out there that correspond to the black, blue and green. In the case of the latter two, these missing types may very well have 12 and 13HD! The fact that Cook has dragon types that Holmes does not and that Holmes has a type that Cook does not (brass) makes me quite comfortable about these unrepresented and potential types of dragons. Since gold dragons are part of the brass dragon pair and Holmes gives them a neutral/chaotic good alignment, it follows that gold dragons are chaotic good. It also follows that since all the colored dragons are chaotic evil when intelligent, so too should blue and green dragons; however, since they are likely the smaller of their respective pairs, they will have a chaotic evil/neutral alignment similar to black dragons (indicating that some have been cursed with animal intelligence). As previously noted, white and red dragons both have breath weapons at the opposite ends of a thermal energy scale. Given that black dragons breath acid (which could be seen as an expression of chemical energy) this suggests that most dragons have a breath weapon of some type of energy. The exception is the brass dragon, which has two breath weapons with spell-like effects. Since the red and white dragons have breath weapons on either side of the thermal energy scale, it follows that the breath weapons of various dragon type pairs ought to as well. Thus, the dragon that would complete the pair with the black would spew a line of a very strong base (the opposite of an acid). It also follows that the gold dragon should have spell effects which are "opposite" of Sleep and Fear. I would propose Confusion and Charm Person. Since thermal and chemical are taken, that leaves the rest as possible breath weapons for blue and green dragons. Color only has a passing correlation (blue could easily be the color of cold, black the color one gets from being burned by fire and red is not the color opposite of white), therefore it will not be of pressing importance. Rather, the most important factor will be opposites that make sense. Since the latter doesn't exactly inspire destructive possibilities, the blue and green dragon will have magnetic and sound-based breath weapons. The color green has a passing association to earth, from which magnets come. Blue has a passing association to air/water through which sound travels. Therefore, green dragons will have a magnetic-based breath weapon and blue dragons will have a sound-based breath weapon. Seeing that blue and green dragons are the most powerful of the "lesser"/female dragons, it follows that there might be extra effects tacked onto their breath weapons. I imagine that green dragons have a lined, repulser breath that moves targets away 10-60 ft (half if the save is made) in addition to the damage. Blue dragons would have a cone of high-frequency sound. Victims could be rendered deaf. In his monster section, Holmes only has stats for four types of dragons (black, brass, red and white). Though dragons do not appear in Cook's monster section, he does include them in his wandering monster tables, including three not found in Holmes (blue, gold and green). While this is interesting in and of itself, one of the more intriguing discrepancies between Holmes & Cook on dragons is armor class. Holmes gives all dragons an AC of 2, whereas Cook gives them an AC ranging from -2 to 3. This prompted me to look at the armor class ranges of all monsters in both editions. I discovered something very interesting: there are no monsters in Holmes that have an AC lower than 2. While there are eight monsters in Cook that do, they have an average of 18 HD and only two (the dragon turtle and the 16HD elemental) have a negative AC. I say this because, what does one do with the bonuses of magical armor? If the lowest AC found in the game is AC 2 and one is armored with a +1 shield and plate +1, what good does all that magic do? The traditional answer in D&D to this problem is to continue out the combat table to include lower ACs; however, if one accepts the reality of only four types of AC, this leaves open the possibility of penalties to the attacker's roll. Conceptually, understanding the shield and any magical bonus as a penalty to the attacker's roll transforms the shield and the magic bonus from being AC to being things the attacker must overcome in order to be able "to hit" the target AC. In other words, if I were a 1st level character trying to hit an NPC wearing leather and carrying a magic +1 shield, I would normally hit on a '12' (according to Holmes); however, I would have to overcome the shield and the magic because I would be subtracting 2 from my roll. This penalty could be easily be understood and noted as a Defensive Bonus. There can be major simplification of combat tables with only four types of AC. There has to be a conversion of monster ACs that do not fall into these four types. For example, AC 4 becomes Chain/DB 1. I have yet to playtest such a system, but a imagine a major complaint might be the math. A reminder: there are very few bonuses in Holmes. Strength has no bearing on combat. Most encounters would require only the penalty due to a Defensive Bonus. For those so inclined, I imagine that implementing a house rule where rolling the exact number you need to hit (a 14 in the example above) would result in maximum damage or some kind of critical hit would give enough incentive that players would adapt very quickly. Portown is a small but busy city linking the caravan routes from the south to the merchant ships that dare the pirate-infested waters of the Northern Sea. Humans and non-humans from all over the globe meet here. In addition, the location of Zenopus' tower is above some cliffs looking over the sea. Thus, Portown lays next to the sea, along a coast line that runs north and south. Cook informs us that the Black Peaks/Cruth Mountains/The Steach are on the north edge of the map and that there are easterly winds coming off of the sea. These two appear to be contradictory. There is a rather large and long mountain range that runs along the top of the map in Cook (who provides no compass rose), but the sea runs along the bottom of the map. This means that, except for a small peninsula south of Specularum, there really isn't any way for easterly winds to come off the ocean if the top of the map is, indeed, north. The coast now runs north-south, so as to reflect the way Holmes describes the location of Portown. If one uses the mathematical definition of easterly — towards the east — this also allows there to be winds that blow towards the east off the sea. The main problem with orienting the map this way is that the mountain range is no longer "running along the north side of the map" as Cook describes it. There is a portion of the range, however, that does now curve towards the west at the north edge of the rotated map. If the names Black Peaks/Cruth Mountains/The Steach are limited to this section in the north (leaving room for other sections of the mountains to be named at a later date), then Cook's description of this mountain range is generally true. This means that the caravans coming from the south that Holmes describes as transferring their goods to ships to go north are coming from Specularum and Fort Doom. 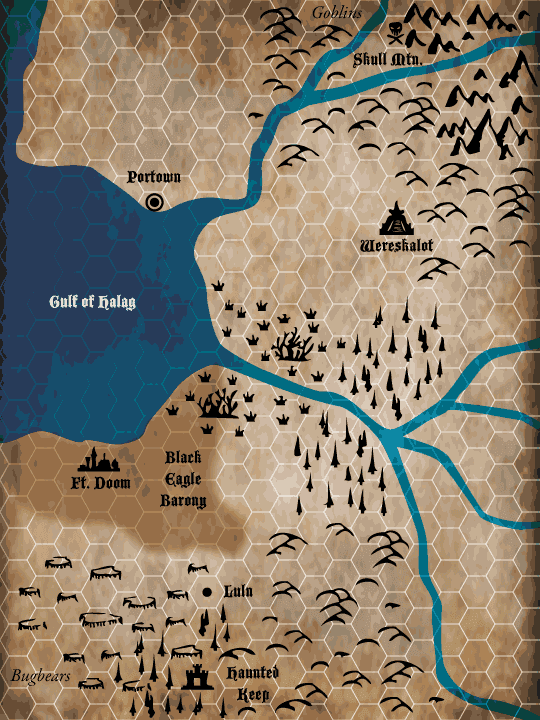 This places Portown either on the northern half of the Gulf of Halag or further up the coast. The most likely place for Portown would be the river mouth that empties into the Gulf. Why do the caravans need to put their goods onto ships and not continue north? What is so valuable that there are ships willing to sail through the pirate infested waters of the Northern Sea? The first has one of two answers: either the area is infested with something even more dangerous than pirates, or the geography makes it impossible for caravans to get across. The latter is most likely (if that something is so dangerous, why isn't it eating the pirates?). I suspect the mountains continue to swing west until they meet the sea, making caravan travel impossible. Since Cook indicates that there are Frost Giants on what is now the southern edge of the map, one could argue for the southern hemisphere, where the farther south one goes the colder it gets. In such a case, the trade in the Northern Sea could be driven by such things as spices, chocolate, cotton, tobacco and tea. If one would rather have the Grand Duchy in the northern hemisphere, the Northern Sea would probably be too cold for things like spices. Trade items might include certain metals such as iron, platinum or certain kinds of steel. In addition, there might be a whaling industry. Personally, I can imagine a fantasy version of the narwhale whose oils burn twice as long as other oils and whose horns are more valuable than ivory — possibly because they are used by magic-users to create wands. I imagine them to be better at absorbing magical energies and are therefore beneficial in the creation of wands (possibly by cutting down in creation time). Today is the feast day of the Holy Martyrs Frontasius, Severinus, Severianus, and Silanus. Theirs is a story that almost has a Grindhouse-kind of sensibility about it. They were sent into Southern Gaul to preach the Gospel during the reign of Emperor Claudius (A.D. 41-54). Arrested by the local governor, they refused to renounce Christ and were martyred. This is when, according to tradition, things get a bit strange. During their martyrdom, Frontasius, Severinus, Severianus, and Silanus were tied to pillars outside the city, had nails thrust into their heads in the form of a crown of thorns and then were beheaded. The story does not end there, however. It is said that the four did not die. They picked up their heads and made their way into the city until they came to the Church where they placed their severed heads. After crossing themselves, they finally did die. These macabre items appear as large iron nails wrapped in iron thorns and caked in dried blood. Though they radiate of magic, they have no effect upon the living. When driven into the head of a corpse, however, the magic with which they are embued becomes manifest. The corpse will animate and proceed to be unstoppably and undyingly driven to complete the one last earthly task that they had wanted to accomplish before they died. Once this task is complete, the corpse dies permanently. Spells such as Raise Dead, Reincarnation and Resurrection have no effect upon the body, no matter how well preserved or how long it has been dead. I realize that this particular topic does not have much, if anything, to do with the rules, per se; however, within my thought experiment, the Grand Duchy of Karameikos as presented in Cook is virtually the only example I have of world-building. As such, I am actually very interested in what kind of information I can glean from a combination of the example dungeon in Holmes and the Grand Duchy in Cook. According to Cook, this is the Grand Duke after which the map is named. The name Stefan invokes the first Christian king of Hungary. Though Karameikos is nothing more than a cool fantasy name, it does bear some resemblance to the Hungarian for staff and Nicholas. This very much suggests a divine magicky relic/artifact that might be known as The Staff of St. Nicholas, which may very well be a family heirloom and/or a symbol of the office of Grand Duke. More popularly known as the Haunted Keep, this name is even more suggestive of Hungarian with its sz and gy. Szegy means breast and kor can either mean heart, circle, age or disease. Taken together, all these words suggest some kind of tragic love story. Its outcome may very well be the origin of the haunting that the keep is now more famous for. Since we already have two names which are Hungarianesque, I find it interesting how close Halag is to the Hungarian for death. The Gulf of Death would be a great place to put Fort Doom, don't you think? This can easily justify all kinds of different character backgrounds and names, as well as the existence of demi-humans within borders of the Grand Duchy. There was also plenty of ethnic chauvinism within the Empire. Despite claims to the contrary, I have never got the feeling that the Hungary part of the Austro-Hungarian Empire were playing anything but second fiddle to the Austrian part. This suggests a reason why the Grand Duke would allow an obvious baddy like Baron von Hendriks to have control over any part of the Grand Duchy. Despite being only a Baron, von Hendriks has a pseudo-Austrian heritage compared to Karameikos' pseudo-Hungarian. Therefore von Hendriks' heritage/contacts have enough pull over the Grand Duke to get his little barony. Though this is basically a meaningless made up name, it does have a Germanic flavor — which fits, given that the town is made up primarily of refugees from von Hendricks' Black Eagle Barony. Speaking of which, the name itself doesn't suggest much; however, a black eagle on a gold field is a heraldic symbol used by Germany. This puts more weight behind the idea that von Hendricks has some family and friends in very high places. Though Steach has a passing resemblance to the German for rise or climb, these names don't imply much; however, it does support the Austro-Hungarian vibe. If you travel within the various parts of Europe that used to be part of the Empire, you will notice that all of the towns will have different names depending upon who you ask. This is the first real departure from the Austro-Hungarian vibe. It has more of a Latinesque name related to the root of the word speculate. Cook informs us that it was originally a port when the area was first being explored. Given the name, I would guess that the original port and exploration was done by a different people than the ones who currently occupy it. Personally, I would need to decide as to whether this change of hands happened within context of the modern civilization or the classical civilization implied in Holmes. Given the Latin-flavor of the name, I am inclined to choose the latter. This is the location of the sample dungeon in Holmes. I find it interesting that it could be understood in one of two ways: — it is a town with a port or it is a poor town. This is the magic user that dug the tunnels that now make up at least part of the sample dungeon in Holmes. The name suggests the Greek for foreigner and foot. Thus, he might very well represent various attempts by a foreign power at getting a toe-hold in the area around Portown. This foreign power is most likely Chaotic and pagan, given Zenopus' activities. This also suggests that Portown is not necessarily within the borders and protection of the Grand Duchy, if this foreign power sees fit to send its agents to explore the ancient city that lies beneath with such impunity. A multi-ethnic/national/racial/linguistic empire modeled roughly on Central Europe. It is part of the modern (Christian/pseudo-Christian) civilization. Despite this, it is plagued by ethnic/racial chauvinism. There may very well be a rivalry between the Grand Duke and the Baron of Black Eagle. Whereas the Baron has friends in high places, the Grand Duke is the current holder of the Staff of St. Nicholas, an artifact that brings both power and prestige. A foreign (possibly secret) power that harkens back to the classical civilization. They are Chaotic and very interested in the arcane secrets of the ancient civilization. They have agents that they send into other countries to find and procure these ancient secrets. Given that Cook gives the Baron a reputation for possible connections with slavers, he may very well be working with this foreign power in order to give him an upper hand in his rivalry with the Grand Duke. The country and people that originally explored and settled the lands of the Grand Duchy. This may have been the outskirts of a Rome-like empire of the classical civilization just prior to its collapse. Remnants of it litter the land. Yesterday, J.B. of B/X Blackrazor reacted to my recasting of the Holmesian Thief in context of Bilbo Baggins by reminding me of his previous post, How Bilbo Baggins Ruined Everything. In his latest post, he is Hating on Rangers. Therefore, I though it apropos to propose the optional Ranger class for a Holmes & Cook amalgam. Unlike other classes, rangers do not need to fire in volleys. When firing into a group, they need not randomly determine their target. Rather, they can shoot at a specific target. As a result, they are able to fire into melee where friendlies are involved and not risk shooting one of their own party. They are also better at tracking and at spotting things in an outdoor environment than other classes. They begin with a chance of 2 in 6 and increase this in the same progression as a Thief (aka Burglar) has with hear noise. Like other fighting-men, rangers may wear any kind of armor; however, wearing heavy armor negates their targeting abilities (they may only fire in volleys). They use the same XP progression and saving throws as other fighting-men. Question: I am curious if there is any opinion out there as to whether or not to have a Dex requirement of 13 or to allow certain demi-humans to be rangers (personally, I am considering elves and halflings, but not dwarves). Over at Grognardling, Staples has taken on the onerous task of rehabilitating the thief class. One of the first things that he did was to tackle the idea that the thief has no archetype. Arguing that there are plenty of thiefly archetypes, he came up with an impressive list, including a Mr. Bilbo Baggins. He then goes on to insist on a name change for the class. He does this in order to better reflect his new list of archetypes. Frankly, I think this is a brilliant idea. Following in his footsteps, I would like to propose a name change for the Holmesian Thief, where the archetype is Mr. Bilbo Baggins. The reason I choose Mr. Baggins as archetype is because Tolkien casts such a long shadow over Holmes. Bilbo, more than any other character on Staple's list, fits into a Holmesian vision of D&D. So much so, that he implies that halflings can become thieves. The name I propose for the Holmesian Thief is the title that Gandalf gives Mr. Baggins in Tolkien's classic The Hobbit — Burglar. the act of breaking into a building esp. with intent to steal. Given that the Holmesian thief has the primary function of opening doors, I think this is eminently appropriate. In light of this name change and its homage to the archetype of Mr. Baggins, I want to take a quick look and all of the burglar abilities in light of this archetype. Open Locks: as I have noted before this ability does not impede other classes from opening locks. Everybody has a base chance to open doors of 2 in 6. This burglar ability, then, represents an extra and stealthy attempt to open doors for the adventuring party. If this attempt should fail, the party still has an opportunity to surprise whatever lies behind the door with a normal 2 in 6 chance to open a door. Remove Traps: personally, this is my least favorite ability of any thief class. Keeping in mind Mr. Baggins, however, this ability can be re-skinned as a saving throw. Bilbo Baggins never really removed a trap, rather he was in the right place at the right time. Thus, remove traps can become a saving throw for when a player fails to figure out to how disarm a particular trap. Making the save means that the burglar is in the right place at the right time. Therefore, every class still has the opportunity to disarm traps. The burglar just has a better knack for it. Pick Pockets: like remove traps, I am not a fan of this ability. Its primary purpose seems to be to steal from party members (something that more often than not can ruin the fun of an evening). Yet, Mr. Baggins does display some sleight of hand. Therefore, I think this burglar ability needs to be treated in much the same way as Remove Traps — as a saving throw. If a player fails to adequately describe the working plan on how to use sleight of hand, the burglar is allowed this saving throw. Again, this does not prevent other classes from trying — it just gives a burglar an extra chance not to fail. Move Silently & Hide in Shadows: these abilities represent the burglar's affinity towards being sneaky (something Mr. Baggins was very good at). This is where I am willing to take a major departure from the traditional mechanics of the thief class. Everyone can be sneaky. Mechanically, this is represented by the surprise roll. Every class has a 2 in 6 chance of surprising an opponent. The traditional percentile rolls for move silently and hide in shadows divorce these abilities from the normal surprise roll. When a thief has the ability to backstab these percentiles seem necessary. The Holmesian thief, however, has no backstab ability. Therefore, move silently and hide in shadows serve no real mechanical purpose. Rather than using these percentiles, I propose that a burglar has an increased chance to surprise. At first level this could start out at 3 in 6. Using the same progression pattern as hear noise, this would increase to 4 in 6 at 5th and 5 in 6 at 9th. This surprise could be handled in one of two ways. The first would be to grant this surprise to everyone in a party that includes a burglar. The other is to allow the possibility for a burglar to have a round of surprise while the rest of the party does not. This latter approach treads closer to the literary source material. There were many times where Bilbo Baggins seems to have an opportunity to act while the rest of his party does not. Hear Noise: humans have a 1 in 6 chance to hear noise. Demi-humans have a 2 in 6 chance. Burglars, whether human or no, begin the game with a 2 in 6 chance and get better as they increase in level. For the reason that it really needs no re-skinning or tweaking, this is my favorite of all the thieves' abilities.